This summer, America’s first offshore wind farm went up right in my back yard. Five wind turbines were installed three miles off the coast of Block Island, Rhode Island. In the grand scheme of things, five turbines is a small wind farm, but it’s the start of a new industry on this side of the pond. When they start powering this fall, the turbines will supply electricity to 17,000 homes in New England. It was amazing to watch them go in. Here is a perspective of how big they are. See the person on the deck? Putting windmills offshore, where the wind is stronger and more reliable than on land, could potentially provide more electricity than produced on the grid. This technology is already used in many European countries. They have become somewhat of a tourist attraction on Block! The last turbine was completed a few weeks ago and now all five are on full display. Here are two in view from the yard of the Southeast Lighthouse. All five in a row off Southeast Light! I love the juxtaposition of this beautiful, rustic island next to the chic, modern turbines. You can see them peeking around the corner all over the island. I can’t wait for them to start turning. 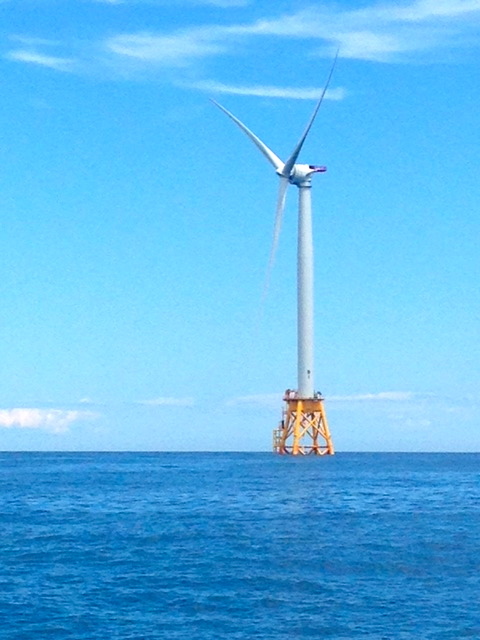 Excited that the Block Island Wind Farm can help provide clean energy. Take a look at this great article by Justin Gillis from the New York Times. Block Island came off very well in the NYT article. I was on Block Island two weeks ago, the wind farm is impressive. I wish more coastal areas would develop wind farms.